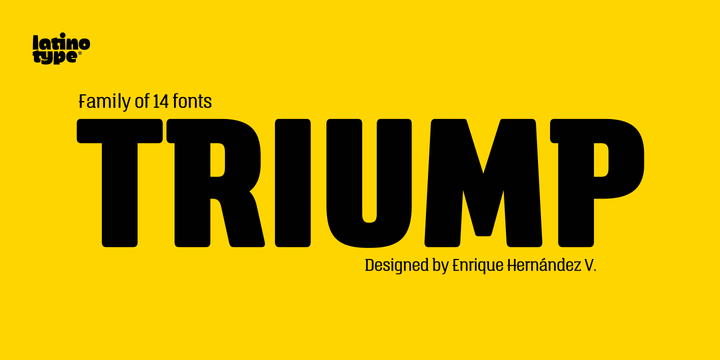 Triump is a condensed sans-serif typeface created by Enrique Hernandez and published by Latinotype that is available in 14 weights from Thin to Black with accompanying italics, ideal for poster, logo, magazine, editorial and web design. The characters has rounded corners and the OpenType Features give a modern look. If you are looking for a vintage look, use Black weight in normal and italic Line. Enjoy! A font description published on Monday, December 8th, 2014 in Enrique Hernandez, Fonts, Latinotype by Alexandra that has 3,648 views.